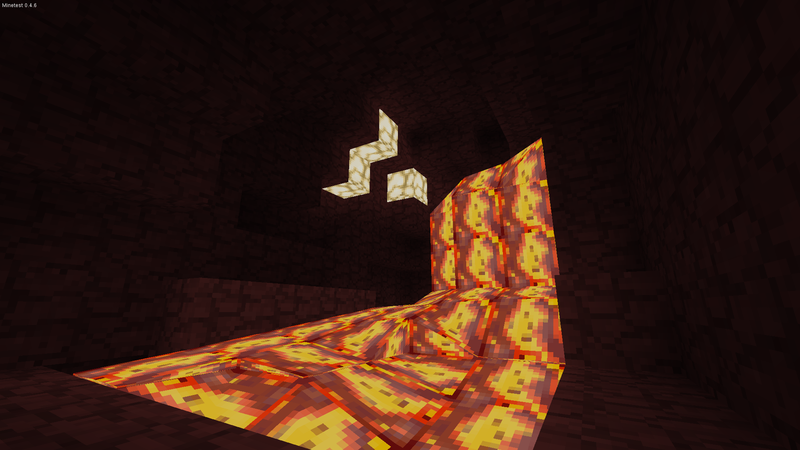 This mod adds a nether to Minetest. 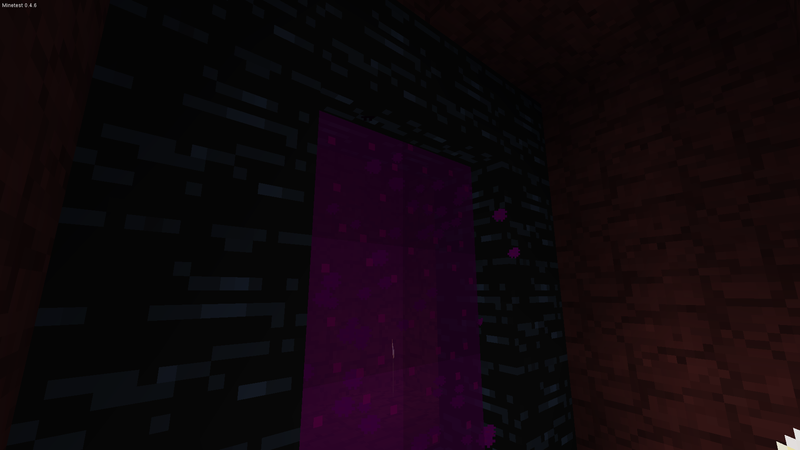 You can go into the nether by either digging deep down or build a obsidian portal as seen in the screenshots above. To activate the portal, rightclick it with a mese crystal fragment. 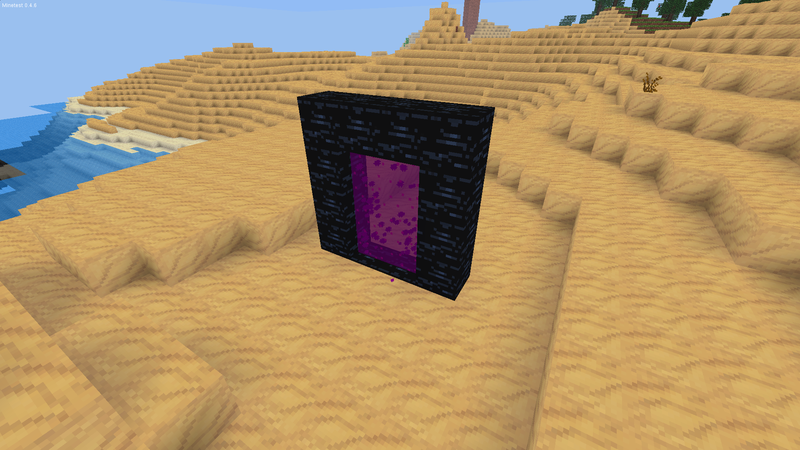 When you go into the portal it will teleport you directly into the nether. A new portal is generated at your spawning point, and it will bring you back to your first portal (Note: the genration of the portal in the nether might take some time (up to 4 seconds)). If one of the portals get destroyed (i.e. an obisidan block gets dug) the connection is destroyed. New portals that are build in the nether will bring you near the surface again. Rare materials like glowstone, nethersand and netherbricks can be found in the nether. Netherbricks only appear in nether dungeons, and are not craftable. You can apply this mod to any map that has not yet generated the area under -5000 (this is most likely not the case). Last edited by PilzAdam on Wed Apr 09, 2014 13:22, edited 1 time in total. Really nice, but sadly caverns are too small, this would be better as a c++ mapgen modification... or is there a way to tell the mapgen the cavern size at a certain height? Nah i want to use ore. I might experiment with sheet ore. I basically change all nodes to netherrack/nethersand/glowstone/whatever, so I dont control the cave size. However, I like this style of the nether better than the MC one. It adds some "claustrophobia" effect to it. Small update: Netherrack now only drops itself with a chance of 1/3. Nice! Hasn't there been another Nether mod? What are the differences? Aqua wrote: Nice! Hasn't there been another Nether mod? What are the differences? Well, except the netherrack everything is different (I also use a different texture for that). AFAIK the old nether mod doesnt even work in the current Minetest versions. I also heard that it was extremly slow, while mine is pretty playable without lag. The old mod seems to generate the nether at the surface and also has trees and stuff, while my mod generates the nether deep underground. So, except for the name the two mods are completly different. IIRC the old nether mod generated the terrain with lua, this mod "generates" the terrain using ores. Both generate it deep underground. The old one seems to use pseudo random so the landscape isn't really good, and it's a lot laggy. I don't think it's so good that the netherrack looks like cobble. So? I think it looks good. Last edited by Zeg9 on Tue Apr 30, 2013 13:22, edited 1 time in total. What's the meaning of the yellow clock? Last edited by PilzAdam on Tue Apr 30, 2013 13:29, edited 1 time in total. Any plans for nether mobs, either a part of this mod directly or in Simple Mobs? Nether is a name used by Minecraft. Why don't we call it Di Yu, Gehenna, or Underworld instead? How far down does this place go? Inocudom wrote: How far down does this place go? Cool mod! instead of using mese fragment, maybe try obsidian fragment! blc34 wrote: Cool mod! instead of using mese fragment, maybe try obsidian fragment! With mese fragments you need 2 rather rare materials, wich is better than only obsidian. Inocudom wrote: Nether is a name used by Minecraft. Why don't we call it Di Yu, Gehenna, or Underworld instead? I have now big plans for this and good new textures etc.